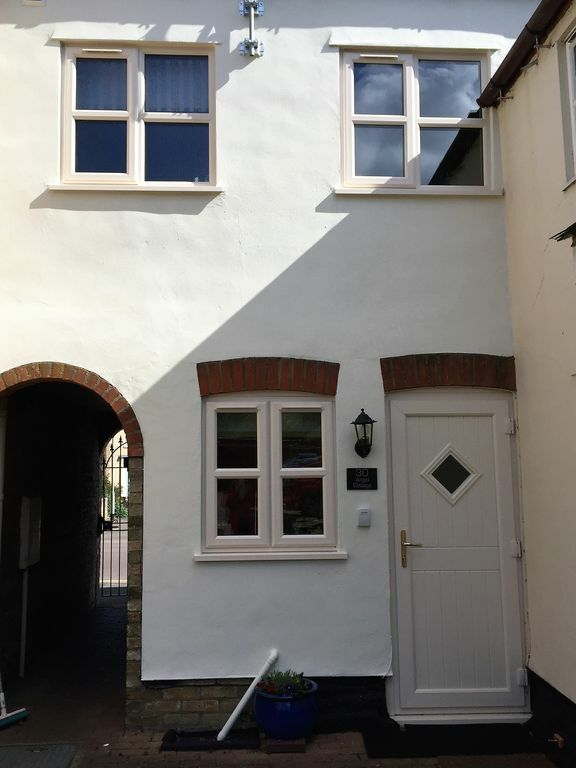 Angel Cottage is recently renovated and ideally situated within Ely conservation area, just minutes from the historic market place, Cathedral and bustling Riverside area. In a development with 3 other properties it has gated parking for one car. Entrance is via the kitchen which is fully equipped with all modern appliances, including dishwasher. Downstairs is a small hallway with cloakroom off and a good sized lounge with original fireplace, dimmer lighting and Satellite TV (Sky) and free wifi. The large cosy master bedroom (double bed) is very comfortably furnished and has an original fireplace. There is also a single bedroom and a smaller room used as a dressing / storage area. Family bathroom. The landing and kitchen offer views of the Cathedral which is fabulous at night when lit up. There is a shared grassed garden with bench seating. Being so centrally located and just 10 minutes walk from Ely station, a car is not necessary to enjoy a stay. The cottage sleeps 3 but could accommodate 4 as a child's folding bed is available on request. Please contact me for further information. Note, Angel Cottage is a no smoking property. We live in Lincolnshire. My husband grew up in a village close to Ely and his family still live in the area. We bought Angel Cottage as our second home and spent several months bringing it back to life. We love Ely and the surrounding area. There are so many historic places to visit and so much to do and enjoy in the City itself and nearby. We hope you will find that too! We like the traditional features in the cottage, having views of the Cathedral and being so close to the City centre. Warm welcome from owners. Cottage is within easy walking distance to cathedral and city centre. It was spotlessly clean with all you needed for a comfortable stay. Lots of places to visit all within easy reach. We are so pleased you enjoyed your stay at Angel Cottage. Thank you for your kind comments and we hope you will visit us again in the future. What a perfect location for exploring Ely, Cambridge and London is only just over an hour away on the train. The property was perfect. Comfortable with everything you need for a home from home holiday. Personal touches from the owners were lovely. Would highly reccommend this property. This lovely cottage is centrally located in Ely, so you can walk practically anywhere in town. Upstairs bedrooms and bath plus extra space for storage and hanging clothes. Downstairs there is a powder bath (handy for those of us with aging knees), spacious living room and well- stocked kitchen. Best windows and doors I’ve ever seen. Janet and David are gracious and accommodating hosts. Would definitely return! Thank you for your lovely comments. We are pleased you enjoyed your stay at Angel Cottage. Lovely home, very clean and tidy. Everything you need for a self sufficient stay. Me and my daughter loved staying at Angel Cottage. It has everything you need for a great stay. The bedrooms were perfect and I already miss the master bedroom I slept in, it's gorgeous and very comfortable! Very good location of the cottage as well, near the riverside, shops, restaurants and the train station. I would definitely recommend the Cottage for a great stay in Ely. We love the cottage and its location. It is well located near the centre of Ely. We used Ely to stay and visit National Trust properties in the area. Cottage is very good equipped for the stay of three people. Closeness of road induces some noise in the evening/night. Being there during the heatwave of June/July 2018 we could not open the windows in bedroom. A real bonus is the private parking at the cottage. We really enjoyed our stay. From the cottage you have very good access to shops, pubs and restaurants. Walking along the waterfront of Ely takes the stress away. Ely Markets: General market every Thursday; Craft & Collectables every Saturday; Farmers' Market every 2nd and 4th Saturday; Sunday market and also on Bank Holiday Monday. Ely has a wealth of attractions to enjoy including: Ely Cathedral & Tower, The Stained Glass Museum, Oliver Cromwell's House, Ely Museum. Ely's Riverside area is a favourite for people watching and you can take a cruise along the river on The Liberty Belle. The Maltings Antiques Centre and the Art Galleries are by the riverside area. There is a huge selection of restaurants, cafes and tea shops within Ely to suit all tastes and budgets.